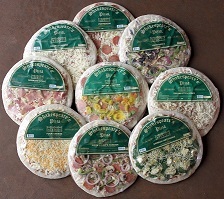 Three Twelve-Inch Shakespeare’s Pizza Pies: either Pepperoni, Double Cheese, Italian Style Pork, Pandas Pepper, Hawaiian, Four Cheese, Spinach Artichoke, Pizza Lovers’ Passion, or Vegetarian. We ship them in an insulated box that holds 3 pizzas. So pick your favorites today. ** Important Information** – Due to heightened security measures regarding shipping dry ice we are offering limited UPS GROUND DELIVERY to the following states: MO, KS, CO, NE, SD, ND, MN, IA, WI, IL, MI, IN, OH, WV, KY, TN, SC, GA, AL, MS, LA, AR, and OK. If you would like to send pizzas to any other state not listed we ask that you call 573-447-2622 and we can discuss options. We apologize for any inconvenience this may cause. You say you want a pepperoni and mushroom pizza? Well, order a Pepperoni Pizza and a Vegetarian Pizza then, once you get them at home, flip those mushrooms over to the pepperoni pizza. Wallaa you now have a pepperoni and mushroom pizza!